I’ve always wanted to make some cool junk light from scratch. As in wires and sockets, the works. But thus far, I’ve cheated and have used existing lights or lamps. But that sure doesn’t mean the cheat method can’t be cool! Take a look at these genius takes on the uniquest lighting out there! The simplest of frames can certainly turn into the coolest! Love this for a patio! Who needs tomatoes when you can have a cool chandelier instead?! 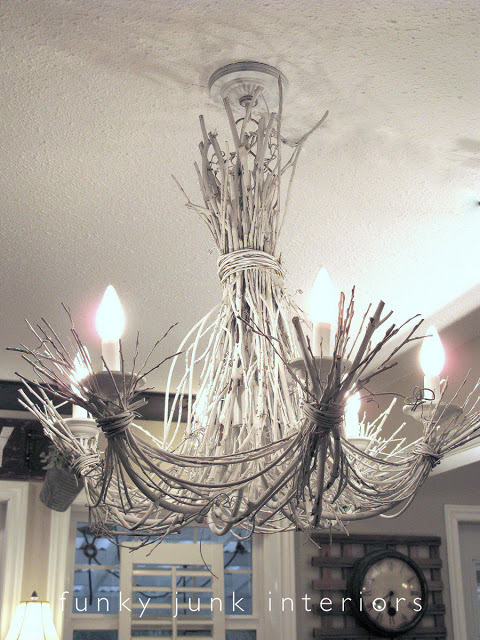 A mix of willow and grapevine branches are hiding the fact that there’s a thrift store chandy hiding inside. 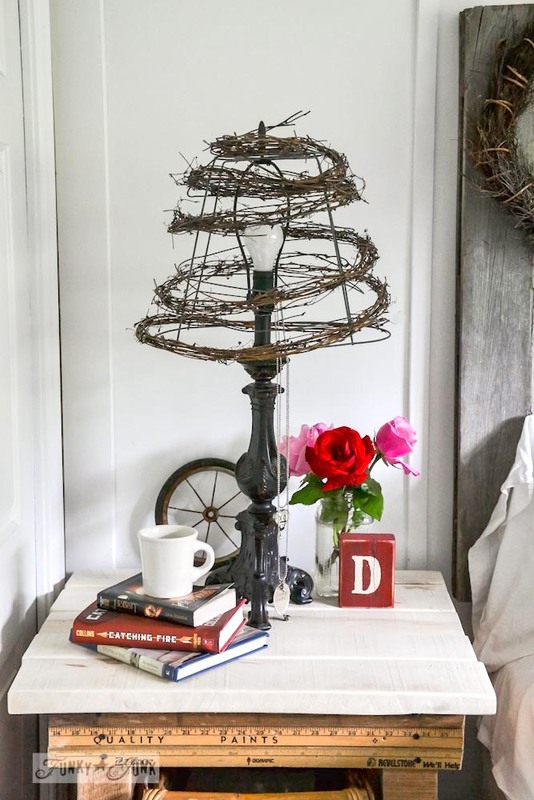 A twig garland plus crumpled up wire basket = one cool lampshade. 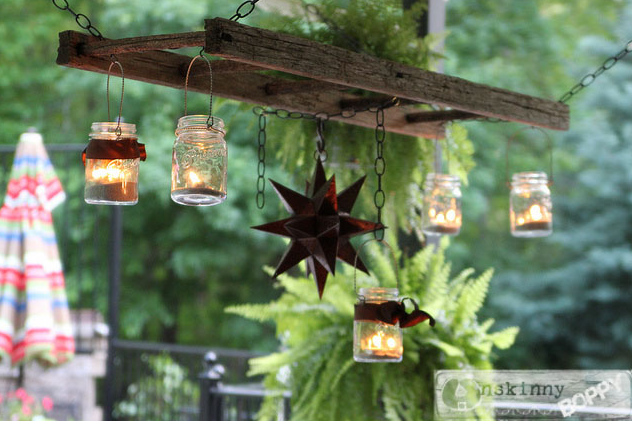 A sweet old ladder teamed up with mason jars provides the perfect illumination for a hot summer night outdoors. 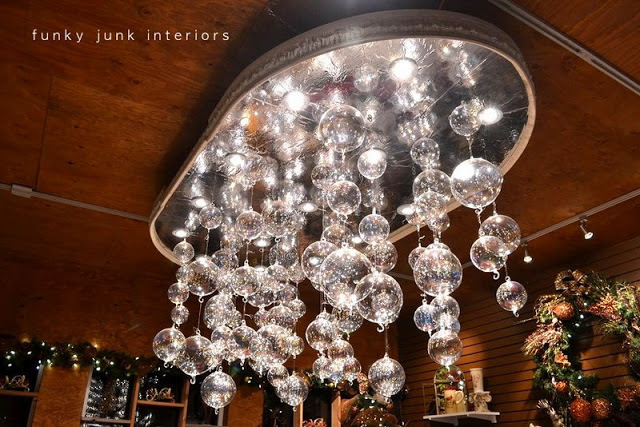 Christmas is celebrated year around in a different way with this smokin’ cool chandy. 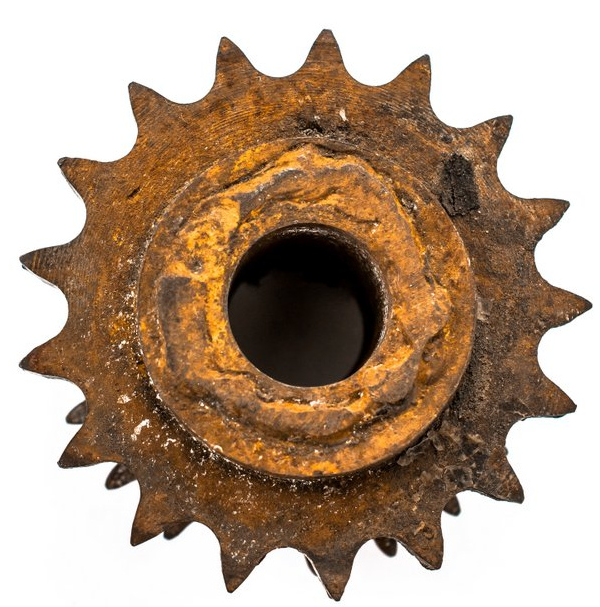 Originally made for a family wedding, it now graces the store. 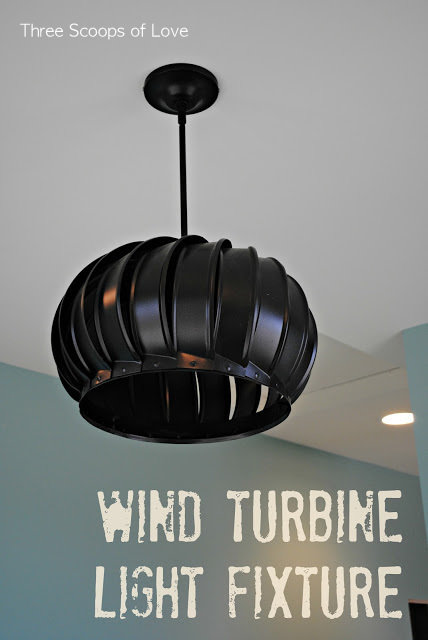 I think wind turbines should legally just be made to be cool wind turbine light fixtures! This is gorgeous! No serious dinners allowed! 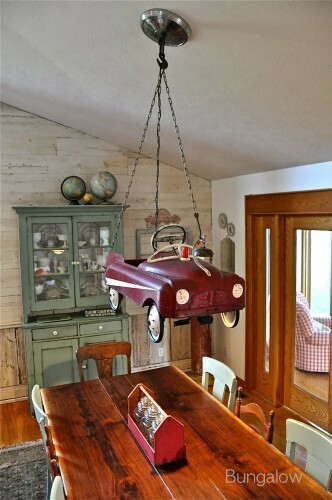 Who wouldn’t adore to sit under this whimsical pedal car light for their daily meals? 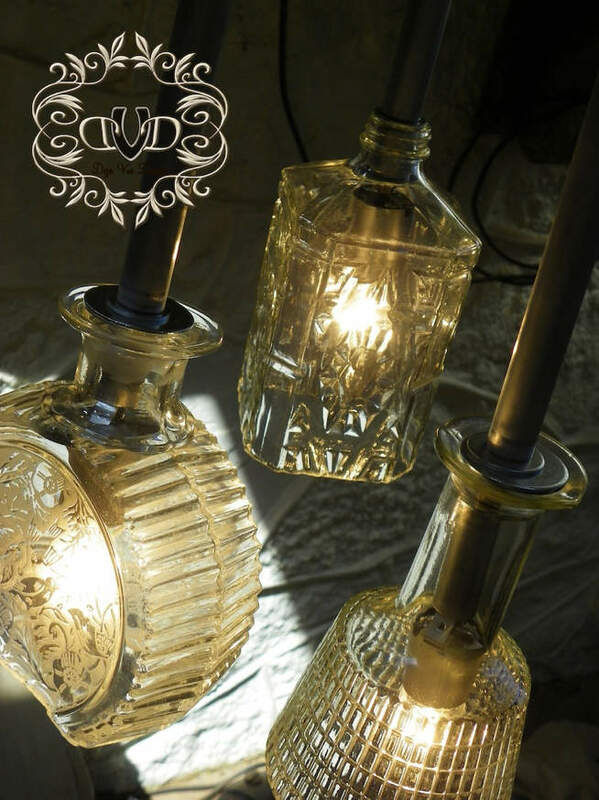 Check out how the light plays with the decanter textures… this is beautiful! 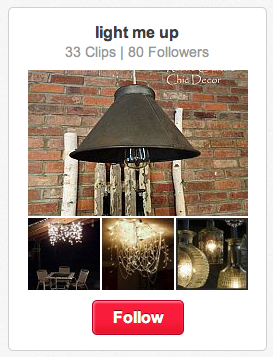 And here’s a cool collection of unique lights I’ve curated over from Hometalk. You’ll love this board! 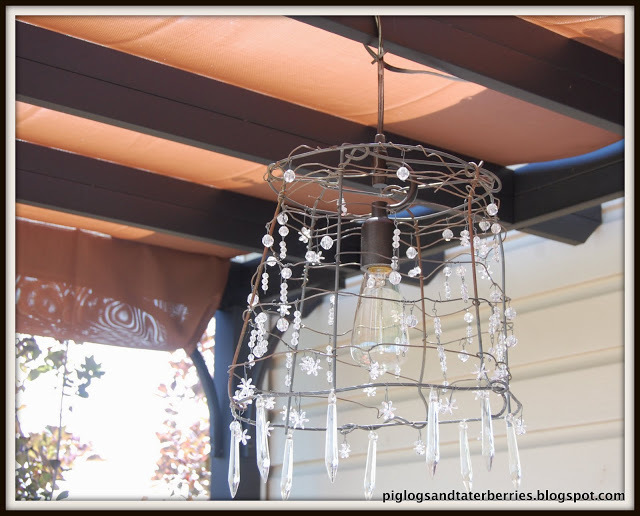 Got a cool light fixture or three? Thanks so much for the party Donna! LOVE the lighting!! Thank you for hosting, Donna. OMG, that pedal car light is amazing! I need one now. Have a great weekend! Hello Donna! Thank you very much for hosting these wonderful parties! So many great ideas to visit! 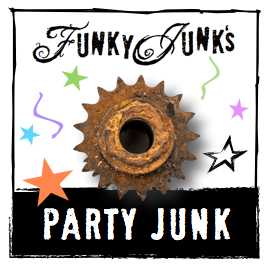 Thanks for the inspirations this week Donna and thanks for continuing to host Party Junk. LOVE all the cool lighting ideas. Thanks so much for hosting! That pedal car light is just too cute! 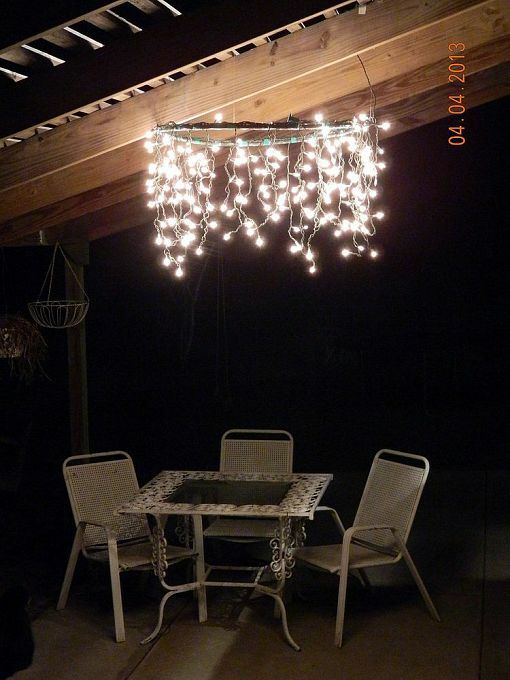 Creative reuse of items to make lights! Thanks for hosting, Donna! Wow. Wow. and Wow!! 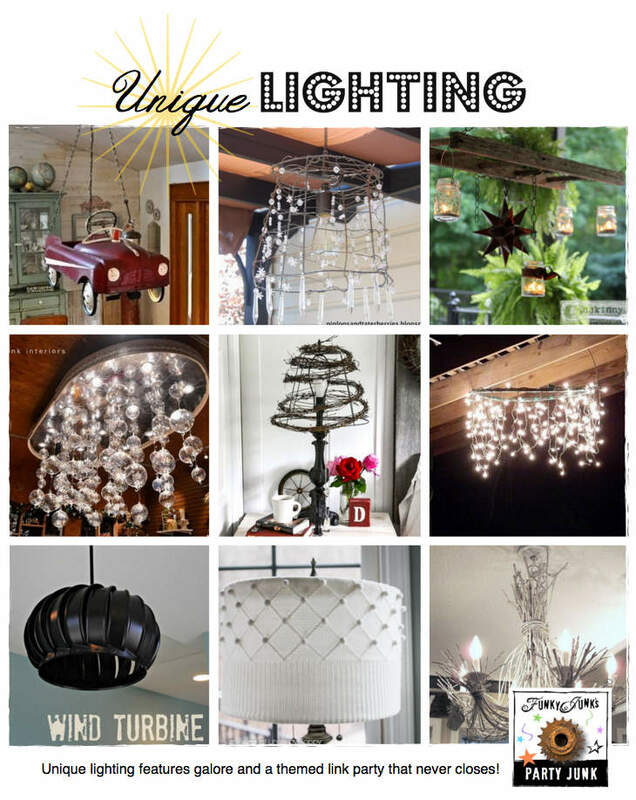 All of those light fixtures are just amazing! I can’t even pick a favorite. Now I want all new lighting in my house. 🙂 Thanks for hosting, Donna! Thanks so much Donna for hosting another great party! I haven’t had the chance to link up the past few weeks, so I’m glad I made it tonight! Hope you have a great weekend…cheers! Love all your ideas. Thanks for hosting this party. It’s my first time partying here and I am so excited to be a part of this and see all the great posts. Thrilled to be linking up tpday! Thank you for Hosting!! Gorgeous Party!! Managed to get my link posted to the right party this week. Yeah! Thanks so much for hosting. I always find so many great ideas here. Have a wonderful week. So happy to be joining you this week! Thanks so much, Donna! So many creative lighting features this week! Thanks for hosting, Donna! Donna, Thanks SO much for the feature this week! And thanks for hosting such an awesome party. 🙂 Hugs, friend! Your linkys are so inspiring, I always leave your blog-home with beautiful inspiration swirling around in my head! Thank you!